The event takes place in 2 areas. The main gym has plenty of seating. The field house has limited seating. We welcome you to bring lawn chairs or another type of alternative seating. Every year, many people wonder what wrestlers and teams will be contending for a High School State Championship in years to come. Now, with the Ohio Divisional State Championships, we can take a peek into the future of Ohio High School wrestling. How is the Divisional Wrestling State Championships structured? There are 3 classes of wrestling which group wrestlers based on the school the wrestlers will be attending in High School. 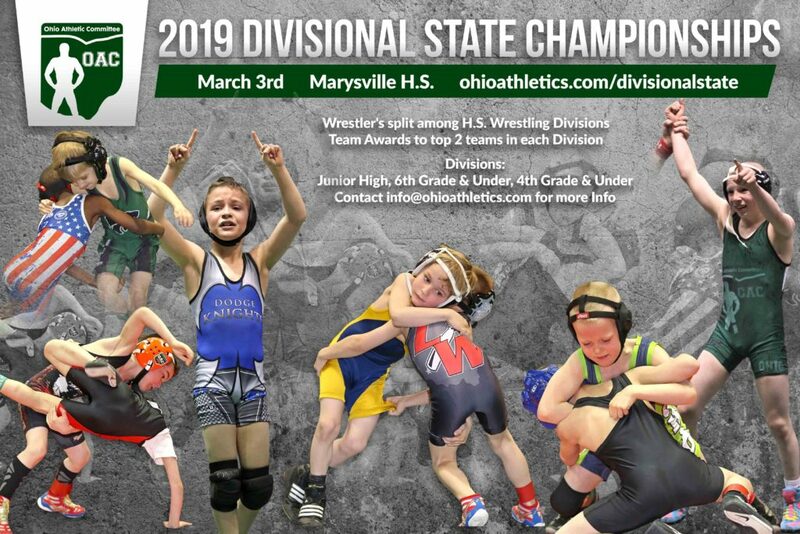 If your wrestlers High School is a Division I school, he will be entering the OAC Class AAA School (or triple A) tournament; if his High School is a Division II school, he will be entering the OAC Class AA (or Double A) tournament; if his High School is a Division III school, he will be entering the OAC Class A (or single A) tournament. Each Class will be competing separately. They will not be competing against either of the other 2 classes. This is exactly how the High School is structured. These 3 Classes are then grouped into Divisions by the wrestler’s Grade level; not birth year. Wrestlers must register for a District tournament prior to registering for Divisional State.